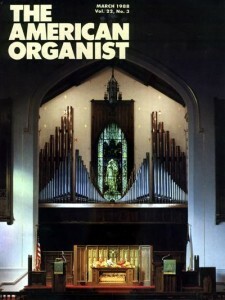 This organ of 69 ranks was built in 1987, and completed in 1988. The instrument replaced a 1922 Moller Organ of about 25 stops, and several of the original Moller stops were incorporated into the new Buzard Opus 5 Organ. The enviable music program at the time this instrument was designed and constructed incorporated several choirs, an instrumental ensemble, and a Renaissance ensemble. (A 27-note Portative Organ was built for Saint James at the same time as the large Opus 5 organ.) The organist at the time was Danville native David Schrader. The former organ was about half as large as the room’s volume and the Church’s musical needs required. It occupied the two chambers on either side of the Chancel and a small echo organ chamber in the ceiling above the rear Gallery. The new organ’s Great and Pedal divisions are exposed on a new structure which spans the distance of the Chancel between the two chambers, allowing choral singers to stand in front of the organ, and the pipes to cherish the large central window. The Choir Division and some Pedal stops are in the left chamber; Swell and Pedal in the right chamber, and a much enlarged Solo Organ is in the old Echo chamber, the sound being conducted down into the Church through a wooden chute. The Console was made in 1945 by Aeolean/Skinner, and was completely rebuilt for the new organ, being outfitted with Harris drawknobs and Peterson solid-state equipment, and bolted to a thin profile portable platform. The windchests are all electrically operated slider chests, except for the unit chests which are electro-mechanical and electro-pneumatic. The new pipes were made by F. J. Rogers, of Leeds, England and Trivo. Original Moller reed pipes re-used in this organ were cleaned, and re-tongued by Trivo. The components of the organ made in the Buzard residence basement shop included all the reservoirs and winding system, “sky-racks” for the reeds and larger flue pipes, framing, and miscellaneous systems. The instrument was primarily built and assembled at the Church, being only 35 minutes east from Urbana, by the Buzard Company’s new crew of young helpers. I am proud to note that one of our first employees, Ray Wiggs, continues on our staff. He builds all of our unit chests, outfits all of our consoles, and wires all of our organs to this day. The instrument was dedicated in recital by organist Delbert Disselhorst. Subsequent concerts featured the University of Illinois Symphony directed by Paul Vermel with Jerald Hamilton as soloist, and solo performances by several noted organists, including Fred Swann. Recently the Danville Symphony and soloist Scott Montgomery celebrated the instrument in concert.